The average cost of memory care in Saint Tammany Parish is $4,712 per month. This is higher than the national median of $4,650. To help you with your search, browse the 2 reviews below for memory care facilities in Saint Tammany Parish. On average, consumers rate memory care in Saint Tammany Parish 4.5 out of 5 stars. Caring.com has helped thousands of families find high-quality senior care. To speak with one of our Family Advisors about memory care options and costs in Saint Tammany Parish, call (855) 863-8283. Over 250,000 people reside in St. Tammany Parish, and more than 16 percent of them are over the age of 65. This is the age group post prone to Alzheimer's disease, which impacts 87,000 people in Louisiana. To care for those in St. Tammany Parish with Alzheimer's and other cognitive challenges, there are 6 memory care facilities, referred to in Louisiana as home- and community-based long-term health services (HCBS). With 14 more sunny days than the national average, no snowfall and winter temperatures 40 degrees and above, the weather in St. Tammany Parish may be a pleasant alternative for seniors who are uncomfortable in cities with a colder climate. The American Lung Association gave St. Tammany Parish a D grade on its High Ozone Day report card and reported that over 40,000 residents in the age group of 65 and older are at increased health risk due to poor air quality. Any facility you consider should provide appropriate support to residents with respiratory issues as part of their standard care plan. The cost of living in St. Tammany Parish is 4.6 percent above the national average and 4.5 percent above the state average, which means you may have higher-than-normal expenses to consider when planning appropriate care for your loved one. Safety should always be a high priority when comparing your area’s memory care facilities to others. The property crime rate in St. Tammany Parish is over 1 percent higher than the national average, while the rate of violent crime is over 7 percent higher. Memory Care costs in Saint Tammany Parish start around $4,712 per month on average, while the nationwide average cost of memory care is $4,800 per month. It’s important to note that memory care rates in Saint Tammany Parish and the surrounding suburbs can vary widely based on factors such as location, the level of care needed, apartment size and the types of amenities offered at each community. Saint Tammany Parish and the surrounding area are home to numerous government agencies and non-profit organizations offering help for seniors searching for or currently residing in an assisted living community. These organizations can also provide assistance in a number of other eldercare services such as geriatric care management, elder law advice, estate planning, finding home care and health and wellness programs. To see a list of free memory care resources in Saint Tammany Parish, please visit our Assisted Living in Louisiana page. 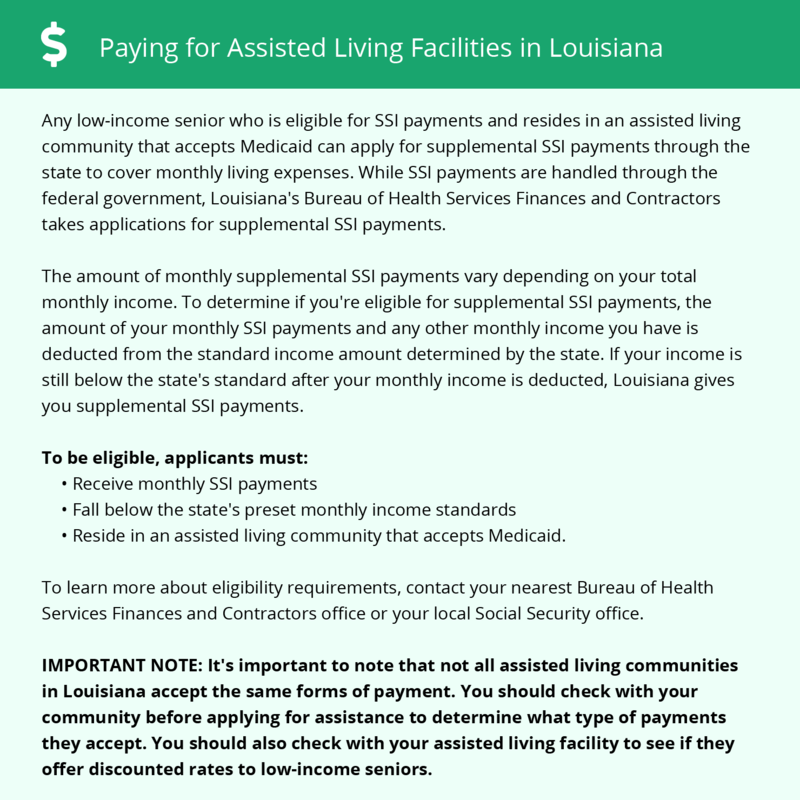 Saint Tammany Parish-area assisted living communities must adhere to the comprehensive set of state laws and regulations that all assisted living communities in Louisiana are required to follow. Visit our Memory Care in Louisiana page for more information about these laws.